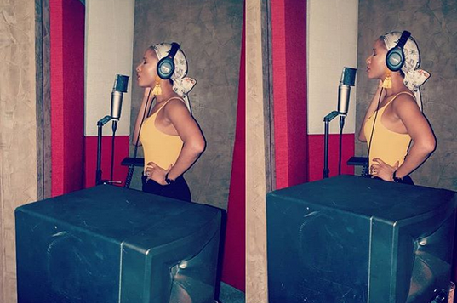 Banky W’s wife, Adesua Etomi seems to have been influenced by her husband, as Adesua today shared photos of herself in a music studio RECORDING. Well we won’t be shocked if her music is well accepted considering her husband’s position in the music industry coupled with if she is lucky to have a good voice. Should Yemi Alade, Tiwa Savage,Seyi Shay be scared? Ofcourse, the likes of Omawunmi, Waje will be like we dey here, how she wan pass, LOL.